The two walls of the elevators containing the doors would either have to be completely removed or radically altered to allow the changes necessary to bring them into the 21st century. This automatic necessary change of 25% of the original material would almost always lead to the removal of the other 75%. In this case, there was a fortuitous combination of an enlightened and patient building management and residents with a varied group of professionals and companies. Harboe Architects, PC were the preservation architects in charge of supervising the process so the historic fabric and character of the building were maintained and respected through the changes and adaptation. Urban Elevator Service, Inc. and Kafka Manufacturing Co. were responsible for the careful removal and installation so the maximum amount could be saved. After convincing the building management and residents that the elevators could be adapted, Urban Elevator Service, Inc. and Kafka Manufacturing Co. determined the absolutely minimum necessary changes and designed the new infill pieces to connect to the remaining original sections. Conservation of Sculpture and Object Studio, Inc. (CSOS) was in charge of the conservation treatment of all the metal sculptural ornamentation. The metal pieces luckily did not have to be altered and were primarily cleaned and had appropriate protective coatings applied. The three original panels had their nitrocellulose lacquer finish carefully washed with solvents to remove the finish while still maintaining the historic patina of the veneers. As many dents, gouges, and scratches as possible were removed without altering the patina. 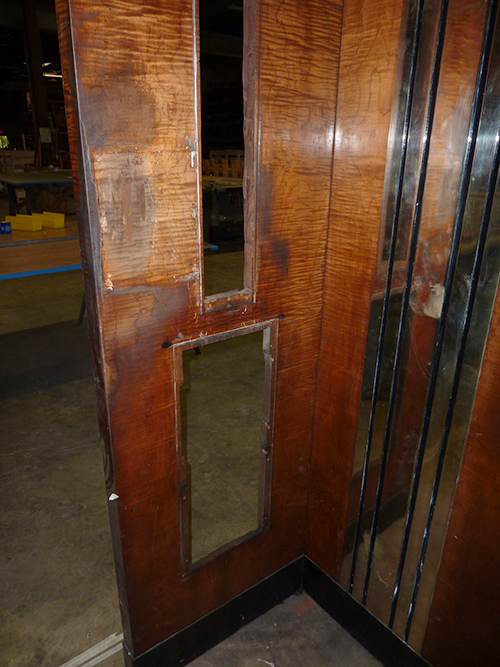 Any veneer loss on the original walls were infilled using veneer taken from the original door panels. The new metal sliding doors were covered with new veneers matched to the original veneers. The finish was then replaced with the new sections toned and blended to match the old. The panels were then given multiple coats of wax and buffed to an appropriate sheen. 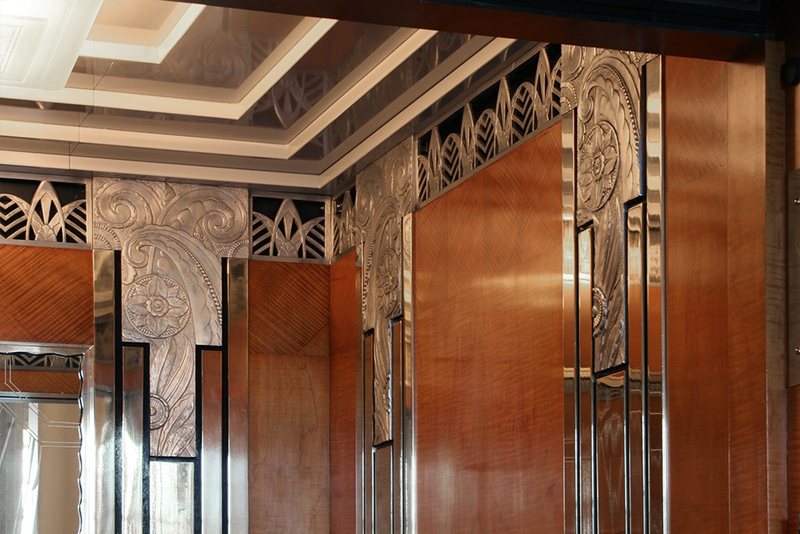 The elevators now have the look of complete well-maintained original pieces of the historic building. That look is the result of extensive cooperation between the building and a variety of diverse professionals. Unfortunately, this merging seldom happens, but it is often possible to adapt the old into the modern world. Many historic elements cannot be put into a museum case but must continue to be used safely on a daily basis. The issue then is how to make the smallest, least noticeable sacrifices of the original material of an object to ensure the continued use of the majority without sacrificing the spirit that made it worth saving in the first place.